Even without the cold in the air and a chance of snow, Rivalry Week is here and better than ever. With a couple years off looming ahead for BYU and Utah in one of the longest standing rivalries in the country the intensity of hatred, slander, pranks, and family divisions has risen to a whole new level this week. The baptism in ice water, Spencer Hadley out-ing, and expensive office pranks highlighted some of the week’s rivalry activity that will be added to the history of beer throwing, “Max Hall hates me”, and “Harline is still open” events of recent memory. It doesn’t matter the record of either team or what conference prize may be on the line because the Holy War is always a bloodbath, and that’s not just for the players. I know that the players don’t like each other, but I’m not even sure there is even a mutual respect among them. It’s just hatred. It’s mean. It’s rough. It’s BYU-Utah. The Utes come into the Holy War at 2-1, after an overtime defeat at home last week against Oregon State. After struggling on offense for the past couple of seasons, however, the Utes seem to be reinvigorated on offense with the addition of co-offensive coordinator Dennis Erickson. Erickson, no stranger to winning with several national championships and all-Americans on his resume, has quickly resurrected the Utah offense into the 17th ranked offense in the nation, averaging 539 yards of total offense and nearly 50 points per game. Though that 50 PPG stat is perhaps inflated by a 70-7 victory over FCS Weber State, they did hang 48 last week against Oregon State. The Utes will be led by sophomore QB Travis Wilson, who has proven that you can have a total look of confusion and stupidity on your face at all times yet still make some smart plays at quarterback. Wilson has already matched his 2012 total of TD passes with 7 and is operating much more efficiently, averaging nearly four yards per attempt higher than he did last season. At 6-6, 240 lbs. Wilson looks more like a defensive end than a quarterback, but his dual-threat abilities make him the key figure on the Utah offense. Two weeks ago BYU was very successful in shutting down Texas’ dual-threat quarterback, David Ash, with a controlled blitzing attack and strong backfield presence by the defensive front four. The supposedly “weak” Cougar secondary, depleted by several injuries to starters, has held their own and played solid through two games. Linebacker Kyle Van Noy was able to key on Ash in critical downs and I would look for BYU to bring a similar defensive strategy against Wilson. On defense the Utes certainly aren’t terrorizing offenses like some of the Utah defenses of the past. In their season opener, Utah State shredded the Utes for 487 total yards and 27 first downs, seeming to move the ball at will against the Utes. Had it not been for cramps that affected Aggie QB Chuckie Keeton in the 4th quarter, the Utes would likely be 1-2 coming into this week’s matchup. Last week Oregon State QB Sean Mannion tossed the ball at will, accounting for 443 yards and 5 TD passes, including the game winner in OT. With the 69th overall defense in the country, it wouldn’t be unlikely for BYU to continue their running game success against the Utes and possibly even find a way to throw the ball a little bit too. Hey, stranger things have happened in this rivalry, right? Is it just me, or does it seem like it’s been two months since the Texas game? It’ll be great to get back out on the field and I’m glad it’s on our field at LES. After a punishing win over the #16 Texas Longhorns two weeks ago that garnered the type of national exposure for the BYU program that drew them to independence in the first place, the Cougars will take the field hoping to play on the momentum from defeating a big time opponent in convincing fashion. Though not as dominating statistically as the defense of last season thus far, the Cougar defense has played well this season. 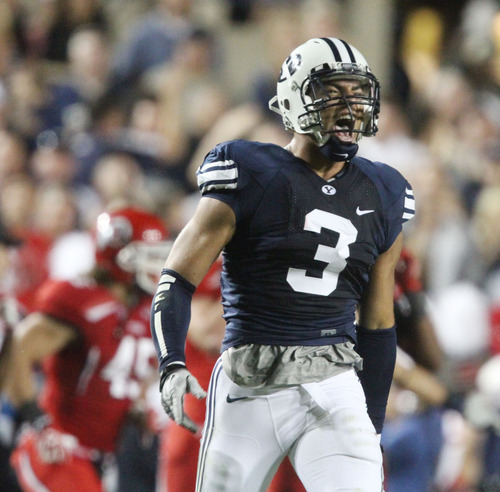 We know all about Kyle Van Noy and the dominating presence he has in every game he plays in. (On a side note, does it look like he put on about 30 lbs. in the off-season? Talking about boosting your draft stock!) Van Noy has been supported by linebackers Alani Fua and Uani’ Unga who lead the team with 16 and 18 tackles respectively. Fua seemed to be in the backfield on every play against Texas, either laying Ash on his back or shutting down the Longhorn rushing attack. With a strong defensive line and a surprisingly effective Cougar secondary, look for the defense to keep the Cougars in this one. here’s hoping that Bronco figured out how to extract that swagger and inject it into Taysom’s right arm. With weapons like Cody Hoffman, Skyler Ridley, and Ross Apo in his arsenal the throwing game is prime for Hill’s taking. I loved listening to Kyle Van Noy on the radio after the Texas game. You could hear the desire in his voice when he talked about beating Utah. “I hate losing more than anything. I hate losing at tic-tac-toe,” he later said. Kyle and the other seniors have gone 0-3 against Utah in their careers and I think that streak finally comes to an end. Even with the losses due to injury in the Cougar secondary and the suspension of party boy, Spencer Hadley, I predict that the Cougars will take care of business at home. The last time BYU won big over the Utes was in 1996. For the first time since, I see BYU winning and winning big, 34-21.